As a part of the already crowded field of diseases transmitted by ticks, you may not know the disease babesiosis, a dangerous infection caused by a parasite that infiltrates blood cells. While babesiosis may sound new to you, scholars believe it is the misfortune described in Exodus 9:3 as the plague visited upon the cattle of Ramses II. While there are many species of Babesia, the most common type infecting humans, and mammals, in the US is Babesia microti, which is related to the parasite that causes malaria. Once inside the body, B. microti targets red blood cells, where it resides and replicates. Symptoms occur within five days to a month after exposure, sometimes making it difficult to diagnose. Because it is best transmitted by a tick in the nymph stage, about the size of a poppy seed, most people do not recall the bite that infected them. For those unaware a tick has infected them, these symptoms can pass as a flu-like infection. Later stage symptoms include anemia, jaundice, and kidney and heart failure. Doctors diagnose Babesiosis with laboratory tests. Healthy patients usually beat the infection without treatment. Doctors treat severe infections with antiparasitic and antibiotic drugs, along with quinine, a malaria drug. How Do You Get Babesiosis? In 2014, the latest year for which statistics are available, 1,744 people came down with babesiosis. The infection is not contagious, but it can spread from mother to unborn child, and through blood transfusion. Between 1979 and 2009, 28 infected people died in the US. Although babesiosis is a parasite that specifically targets and resides in red blood cells, the American Red Cross does not currently screen for the infection in blood donations. The agency indicates it is participating in an investigational study to identify babesiosis at selected blood drives in the US. 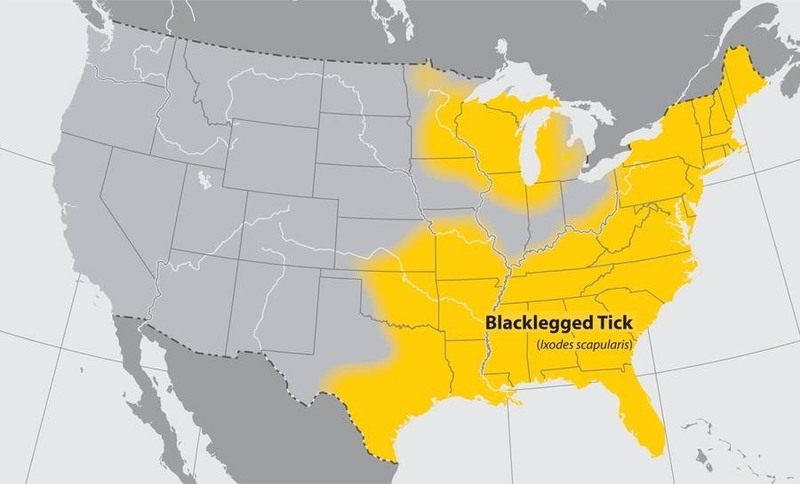 The primary transmission point for babesiosis is Ixodes scapularis, the blacklegged tick that is responsible for spreading Lyme disease as well. The photograph at the top of this article depicts a blacklegged tick after a blood meal. While older ticks can transmit babesiosis, it is often spread by younger ticks in the nymph stage, which are harder to spot. According to the Centers for Disease Control and Prevention, transmission of the infection requires attachment by the tick for more than 36 hours. That leaves some hope that routine showering and tick checks after an outdoor excursion might locate the tick before it can insert the parasite into your body. First identified in the US in Massachusetts in 1969, babesiosis has spread to every area the blacklegged tick takes it. Babesiosis is present in other parts of the world too. While there are a bunch of tickborne diseases, not all of them are transmitted by the same tick. The blacklegged tick does not spread Rocky Mountain Spotted Fever (RMSF), but the brown dog tick does. The lone star tick spreads ehrlichiosis, but not Lyme disease. The western blacklegged tick causes infections of anaplasmosis and Lyme disease — but not babesiosis. Worse yet, the conversation about chronic Lyme disease and coinfections is getting louder. While babesiosis is diagnosed less often than Lyme disease, there is growing concern that stubborn or "chronic" cases of Lyme disease is caused by infection with more than one tickborne disease, like Lyme disease and babesiosis. These coinfections can result in more severe, longer-lasting symptoms and disability. The blacklegged tick can share Lyme disease, babesiosis, and the Powassan virus. Overall, you should consider any encounter with a tick to be a flirtation with infection. Taking precautions to avoid, identify, and remove all ticks is your best strategy to reduce the risk of infection from a tickborne disease. Unless a Californian is on holiday in the eastern part of the US, their chances of getting babesiosis are small. Know your risk of specific infections by knowing where the ticks are that carry those diseases. No location in the US is entirely safe from tickborne disease because the brown dog tick, which carries RMSF, is found throughout the country. Dress in light-colored clothing that allows you to spot ticks. Wear long sleeves and long pants, with pants tucked into socks and boots to create a "tick barrier." Use DEET repellent and treat clothes with pyrethrins. Clear brush and debris away from your home and yard. Check yourself and your dog whenever you return from tick-infested areas. On dogs, pay attention to the ears, jawline, stomach, armpits, and backend. With the addition of the hairline, the same advice holds for humans. With ticks, avoidance is the best policy. Beyond that, if you find a tick on you or a family member, make note of when you removed it, and the part of the body on which it was found. If symptoms start to show in days — or months — talk to your doctor about the possibility of a tickborne infection.